The Order of St. Jean de Brebeuf, named for our Patron, is the highest honour that can be bestowed on a member of the Brebeuf Community. Recipients are inducted in recognition of achievement that exemplifies the values and ideals for which Brebeuf College School stands, namely: Faith, Discipline, Integrity, Hard work, Humility, Excellence, Success, Pursuit of the Greater Good, Friendship, Community, and for always being Men and Women for Others. The Order is open to all members of the Brebeuf community, both individuals and groups, past and present, including: Staff, Students, Alumni, Parents, Supporters, Jesuits, Presentation Brothers, & Benefactors. The 2018 Induction Mass and Luncheon will be on Sunday, October 21, 2018. Order tickets at www.orderofbrebeuf.com. Charles Foran, class of 1979, is a highly successful and highly regarded Canadian author, educator and supporter of human rights. Charles has received numerous accolades for his various books and novels. Charles is the past president of PEN Canada, an international not-for-profit that fights for the rights of free speech and free thought. He continues to Chair the PEN Canada Advisory Board and is a regular contributor to various publications on issues of social justice and improving mankind. Since 2015 Charles has been the CEO of the Institute for Canadian Citizenship, an organization committed to welcoming new Canadians through culture and advancing conversations about citizenship. He is truly a Man for Others. A graduate of the Class of 1982 and a current staff member at Brebeuf, Eric demonstrates so many of the characteristics that define Brebeuf. He is not only a terrific resource for staff and students, he ensures that “spirituality” is present in everything he does. Eric gives selflessly of his time and resources. He coordinates the annual Easter trip to Rome, sacrificing his own time with his family to ensure the students have a memorable experience. Eric is known for his work on the Kairos’ retreats and for ensuring students reflect on their experiences. As a teacher and coach, Eric demonstrates faith driven leadership, which is appreciated by the Brebeuf community. He consistently goes above and beyond what is expected. His passion and commitment has resulted in changed lives for so many. Eric lives” the life of a Man for Others. Joseph is an internationally renowned author, teacher, humanitarian and social activist. A staunch advocate for First Nations people, Joseph is a driving force behind Camp Onakawana , helping at-risk indigenous and non-indigenous children. He is also a voice for mental health, sharing his own experience with depression in the hope of helping others. Joseph is a Member of the Order of Canada, recipient of the 2008 Giller Prize, CBA Libris Author of the Year, McNally Robinson Aboriginal Book of the Year Award among numerous other accolades. He writes stories with social messages and gives tirelessly to the various communities and peoples with which he is connected. He is a true “Man for Others”. Robert Meagher was the founder and first principal of Brebeuf College School. 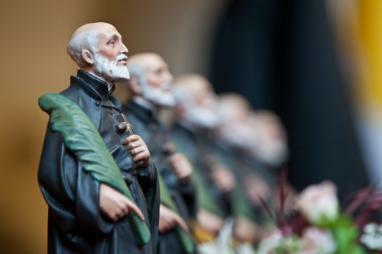 It was his vision and tenacity that saw Brebeuf rise from idea to reality. He served as principal 1963-1972, laying the foundation of a school community dedicated to discipline, effort, academic excellence and Catholic values. Robert Meagher hand-picked the school’s original 15 staff members, designed the school crest and authored the school’s motto (“Studio Gradum Faciant”). Most importantly, he personally oversaw the development of many of the Brebeuf traditions which continue to this day. Quite simply, without Bob Meagher, there would not be a Brebeuf College School. After leaving Brebeuf, Bob continued his passion for teaching and for developing young men at St. Andrew’s College and continuously encouraged his students to become “Men for Others”. An alumnus (class of ’81) and a long serving and highly respected member of the Brebeuf staff, Michael has dedicated his career to developing his students and providing strong guidance and leadership to all. As a teacher, coach, and key member of the Guidance Team, Michael has always placed the needs and goals of his students above all else. He is regarded by both students and fellow staff as a first class counsellor who has a special place in his heart for “at-risk” youth, for many of whom he has played a pivotal role in their development and futures. Michael is also a strong supporter of Brebeuf’s annual leadership and services trips to developing countries and the annual Can-Aid drive. Michael’s kindness, compassion and intelligence exemplify the best of the Brebeuf community. He embodies the true spirit of Brebeuf. He is without doubt “A Man for Others”. Dennis is a well-regarded lawyer, a dedicated family man, a strong community leader and to some a ‘life saver’. His many contributions to the community include his work in the legal community, the Brebeuf community and his constant support for those in need. He was a founding member of the Brebeuf Alumni Association and remains an active member today as do his two sons, also Brebeuf graduates. Dennis consistently supports the development of young lawyers through a co-operative program he developed. As a coach and a teammate, he is always there to assist. During a fundraising hockey game one of Dennis’ teammates collapsed. Dennis fought vigorously to save his teammate until medical staff arrived. Less than one week later, due in large part to Dennis’s effort and commitment, his teammate returned home to his wife and family. Dennis would accept no recognition for his life saving efforts, once again demonstrating that he is a “Man for Others”. Ted and Joan Belton are cornerstones of the Brebeuf foundation. As local community leaders, they gave tirelessly to the growth and prosperity of Brebeuf. The Beltons recognized early the value that a school like Brebeuf could offer and even before they had children attending the school, they became avid supporters and contributors. 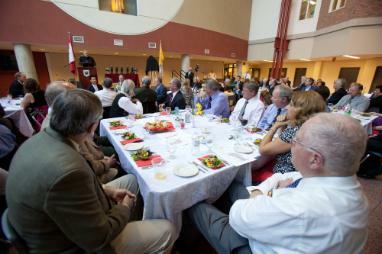 Their support and guidance was valued by all – from school Principals and Administrators, to staff, students and parents. The scope of their involvement was immense from fundraising, to chairing committees such as The Brebeuf Ladies’ Guild and The Benefactors Society, to bridging the gaps between parents, students and staff. Both lived model, modern, Catholic lives in dedication to God and to their community. Father Brennan, a former teacher and chaplain at Brebeuf, is an inspiring, enthusiastic leader who gives tirelessly to the education and development of students in everything he does. He brings a unique ability and passion for helping students to discover God in all things seen and unseen and encourages all to discover their own sense of social justice. He consistently demonstrates an abundance of love, understanding, humour and appreciation of life. He makes you feel important in his presence. He not only is a “Man for Others” but has encouraged so many students to live their own lives as “Men and Women for Others”. Bob Carty was a journalist, a musician, a strong family man, a dedicated Christian but above all he was without doubt “A Man for Others”. He spent the vast majority of his career ensuring the stories of the less fortunate and those whose rights were being inhibited were told. From an early age he developed a passion for social justice and human rights and fought tirelessly for those who needed help, with a particular focus on Latin America. He had a natural ability to tell “human stories” in unforgettable ways. This was true in both his music and his journalism. Driven by a belief he had a role to play in changing the world, Bob spoke and sang for those whose voices might otherwise have been suppressed. Kevin is a man who has faced adversity and risen above it with courage, discipline, humility and faith. As an active community leader and volunteer, a dedicated family man with a successful career in hand, Kevin suffered a stroke at age 43. Following months in hospital and many more in recovery, Kevin found the strength and courage to not only regain his physical capabilities but more importantly to demonstrate his commitment to helping others and to return to his community and volunteer activities. He continues as an active supporter for several charity organizations and other support mechanisms for stroke survivors, volunteers for numerous organizations and shares his experiences to help others. He is an inspiration to all. The Brebeuf Ladies’ Guild was among the first and most influential of parent driven organizations affiliated with Brebeuf. “The Ladies” not only organized numerous events to raise much needed funds for school activities but also demonstrated a commitment to a more cohesive school and family community. Their support and guidance and “motherly advice” was tremendously valuable to the school, the students and the Brebeuf Community as a whole. These volunteers were clearly “Women for Others”. A founding staff member and Brebeuf teaching legend (1963 – 1995) Jim Barry is regarded as one of Brebeuf’s finest and most memorable teachers, renowned for his enthusiasm and dedication, his creativity and encouragement, and his success in building men of character. Jim is a coach, an educator, an actor, author, a devoted family man and an inspiration to so many. A dedicated volunteer with Jean Vanier’s L’ARCHE community and the Cancer Society, Jim continues to mentor many young teachers looking for assistance. Jim gave Brebeuf the tradition of Triple Bronze, a fabled hockey championship, a legacy of teaching excellence and so much more. Rosemary’s dedication, professionalism, and selfless nature have earned the respect of both teachers and students. Rosemary’s commitment to her students is evident not just as an educator, but also through the different roles that she has assumed. Some of these roles included moderator for Student Council, DECA, and Curling. She has also given countless hours of her time in organizing events that recognize the success of students, teachers, alumni, and the community. These include graduation ceremonies, athletic banquets, retirement functions, Music Department excursions, Alumni functions, and much more. She has been instrumental in organizing events to raise awareness and funds for the Children’s Wish Foundation and for the Pulmonary Hypertension Association. Rosemary’s longstanding commitment to Brebeuf and to community service reflects and embodies the true meaning of “women for others”. Simply put, without Frank there would not a Brebeuf Alumni Association. No other alumnus has demonstrated the level of commitment and dedication to Brebeuf as Frank has shown in the more than 30 years since he graduated. Upon graduating in 1982, Frank first served on the Alumni Association Executive, chaired the 25th Anniversary celebrations and became Alumni Chairman in 1986, leading the alumni from its infancy to a mature and relevant constituency within the Brebeuf community. Through Frank’s leadership, the Alumni Association created the Brebeuf Futures Foundation to raise significant funds for Brebeuf and helped establish several scholarships. He has also served as an advisor to the last six Principals and continues to be a pillar of the Brebeuf community. Brother Maher always thought about others first and how he might be of service to them. As Principal from 1984 until 1993, he was a father figure to many in the Brebeuf community, be they staff, students, religious or lay, alumni, parents or friends of the school. Br. Maher was always available and always supportive and always put the needs of others above his own. He provided leadership in so many ways including the transition from the Jesuits to the Presentation Brothers; most importantly he exemplified the spiritual side of the Brebeuf community. He was committed to the ideals of Catholic education and influenced so many by his caring nature. He had a unique way of recognizing each individual’s personal needs and attributes. Brother always described Brebeuf as a “school with a difference”; Brother Maher made a tremendous difference to so many Brebeufians. FATHER J. WINSTON RYE, S.J. Father Rye is a cornerstone of the Brebeuf community. He has held many official roles at the school and within the community but he also remains a loyal and dedicated friend and patron of Brebeuf. He first came to Brebeuf in 1971 as a Jesuit teacher. He later returned in 1978 as the school’s Rector and in 1979 also became the school’s Principal. Father Rye oversaw the transition of Brebeuf’s administration from the Jesuit Fathers to the Presentation Brothers in 1984. In addition to his time at Brebeuf, Father Rye has also been the Principal at Loyola High School, Gonzaga High School and St. Bonaventure’s College, was past Director at The Martyr’s Shrine in Midland, Ontario and has served many key roles within the Jesuit Order. He has continued to be a regular Religious figure within the Brebeuf community. In all that he does for Brebeuf, the Jesuits, the Church, and the Community at large, Fr. Rye does with the ethos, the faith, the humour and friendship of “A Man for Others”. Tom is an alumnus of Brebeuf (Class of ’84). He is a talented educator and an even more talented musician. He has taken his God given skills as a musician and used these to help drive messages for social change. His rare blend of strong popular music sensibility and powerful social messages has lead the media to refer to his music style as “activist pop”. Tom continues to educate youth through various programmes he has developed to encourage positive social change. Tom is a four-time Juno Award nominee and has performed across Canada and around the world, often going to the most remote and needy areas to bring his message of hope and social justice. In Tom’s words “… music is the most powerful tool to promote social, political and moral change in history” and his music is changing the world. Father Beaudois taught at Brebeuf from 1966 – 1983. His high academic standards and intense discipline helped to establish Brebeuf as a school of academic excellence. He inspired students to work hard and be prepared for class, but he also demonstrated a strong commitment to his faith and to community. Father Beaudois was once quoted as saying “My purpose is to teach students to become Christian gentlemen, role models in their communities with a sense of higher purpose and to help those around them”. 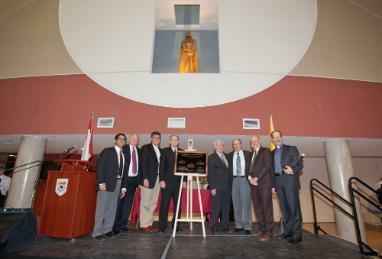 The school’s “Man for Others” award was named in honour of Father Beaudois when he retired in 1983. He remains dedicated to serving the Church as a Jesuit priest. Bob was among the first graduates of Brebeuf College (Class of ’68), where he distinguished himself both academically and in extra-curricular activities. He returned to teach at Brebeuf from 1973 – 2003, and he spent many years as a devoted teacher and later became a well-respected guidance counsellor. Bob was also very active in extra-curricular activities while on staff, participating energetically in Monday Floor Hockey, baseball and as a Coach for the Brebeuf Redmen Hockey Team. He also initiated a variety of leadership programmes at Brebeuf. Bob always put the considerations and interests of students first. Throughout his career, Bob has dedicated his life to helping others and to the creation of leadership experiences in an international context. In one former colleague’s words: “No one deserves this recognition more and anyone who taught with or was taught by him can attest to this”. Catherine stands out as an individual who clearly embodies the “Men and Women For Others” ethos of Brebeuf College. As an Art teacher at the school, Catherine is highly dedicated and professional and easily earns the respect of fellow teachers and students alike. She teaches with such enthusiasm and inspiration and encourages students to create works of art of the highest quality. Many of these pieces help to beautify the school. She is kind, humble, gracious and affable. Catherine is also a role model of charity and each year since 1990 she has organized the annual “Fast-A-Thon” through which students raise funds for the Volunteer International Christian Service (VICS), a mission to help those in the Developing World. Through her efforts, Catherine continues to educate students as “Men For Others”. Greg is an alumnus, a former teacher, and a past Vice-Principal at Brebeuf. He began his teaching career in Zambia, Africa and he returns to Africa regularly to continue to foster leadership programmes for students and teachers, both here in Canada and abroad. Greg is a committed and demonstrated Christian, an innovator, an outstanding educator, dedicated father and family man, a successful coach and without doubt, an exceptional leader. During his tenure as a Brebeuf staff member, Greg founded the Brebeuf Alumni Association and the rugby programme. In addition to his outstanding contribution to Brebeuf, Greg continues to serve selflessly with various communities at home, in the developing world, with at-risk-youth and with students of the world. He truly is “A Man For Others”.